Plummeting temperatures encased the natural phenomenon in surrounding ice, but a warm front could free it up. 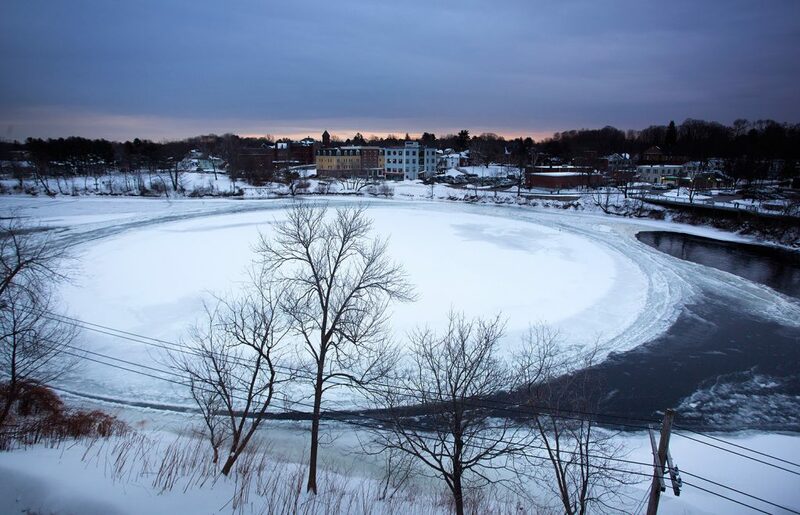 Westbrook’s world famous ice disk has been frozen in place since Tuesday, when air temperatures sank to single digits. But the huge circle is still clearly visible on the surface of the Presumpscot River even as it is encased in the surrounding ice sheet. And it could spin again if the milder temperatures arriving Wednesday night and Thursday break it free. Or it could just melt away. The forecast calls for temperatures to rise to 40 degrees by Thursday morning, and as high as 50 degrees during the day Thursday. In addition, rain is expected Wednesday evening into Thursday. The disk first appeared Jan. 14 and it slowly rotated in place for the following week, although it required a little human intervention at one point last week when a man on a paddleboard used an ice pick to break it free from the frozen riverbank. Similar spinning circles of ice have been documented across North America and Europe, always on rivers when water temperatures and other conditions are just right. The phenomenon is believed to result from a combination of current and a vortex beneath the ice, the result of a column of cold water sinking to the bottom of the river at the center of the circle. As the ice sheets spin, they are shaped by the surrounding ice into perfectly symmetrical circles. However, such disks usually aren’t spinning in high-profile locations like downtown Westbrook, and they usually aren’t so large. The Presumpscot River ice disk was about 100 yards across for most of the past week, but it grew even larger over the weekend and early this week until it eventually got iced in. The disk has attracted crowds of curious locals as well as worldwide media attention with reports by the BBC, U.S. television networks, The Boston Globe, The Washington Post and The New York Times, among others. A webcam mounted on a nearby building at the request of Brown University and other researchers continues to document the ice disk in its dormant state. Among other things, the researchers want to record what happens when it warms up. The action on the live stream has been a little slow since the sun went down Monday. But the saga is sure to take a twist soon, one way or the other.